Pontella Mason is one of Baltimore’s unsung visual artists. He has created murals for the Anacostia Community Museum, former President Jimmy Carter, and several other public organisations. 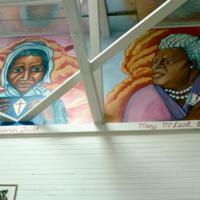 His murals depict African American life and the diaspora. 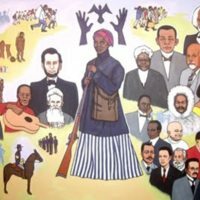 In 1999, he created the extensive mural Ancestral Roots, which depicts the antislavery heroes Harriet Tubman, Sojourner Truth, and Frederick Douglass, as well as Martin Luther King Jr., Malcolm X, Muhammad Ali, Notorious B.I.G., Tupac, Shirley Chisholm, and Marcus Garvey. 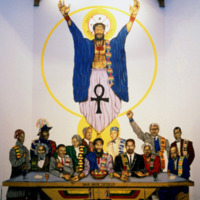 In 1990, muralist Maurice Myron Jenkins created an alternative version of Leonardo da Vinci’s 1494 fresco The Last Supper. 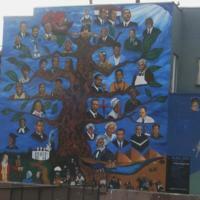 The 30 by 19 foot mural depicts the last supper with a black Christ and 12 historical black figures as the prophets. 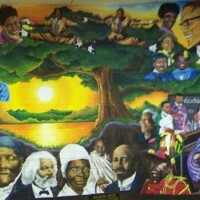 Jenkins chose the Union Temple Baptist Church in Anacostia, Washington D.C. as his canvas because of its role in black history all the way back to its affiliation with Anacostia-resident Frederick Douglass in the 19th century.The mural includes the antislavery figures of Sojourner Truth and Frederick Douglass, as well as Marcus Garvey, Martin Luther King Jr., Rosa Parks, Elijah Muhammad, Malcolm X, Mary McLeod Bethune, Nelson Mandela, Booker T. Washington and W.E.B. Du Bois. 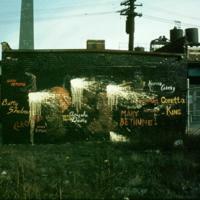 In 1985, muralist Curtis Lewis created a mural on the side of a drug rehabilitation centre on Gratiot Avenue, Detroit, Michigan. The building belonged to Operation Get Down and included the antislavery figures Frederick Douglass and Harriet Tubman, as well as Malcolm X, Mary McLeod Bethune, Jesse Jackson, Thurgood Marshall, Martin Luther King Jr., W.E.B. Du Bois, Booker T. Washington, Ida B. Wells, Marcus Garvey and Nelson Mandela, alongisde Egyptian, Nubian and pharaoh figures. The man who breaks free of his chains in the centre of the mural holds a sign that reads, “Behold my people, arise, stand strong and proud, for ye come from pharaohs, emperors, kings and queens.” The mural was destroyed in 2013. 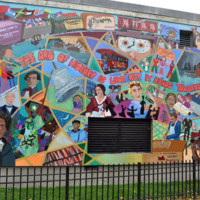 This mural was painted in the 1990s on the side of the Parkview Recreation Center in northwest Washington D.C. 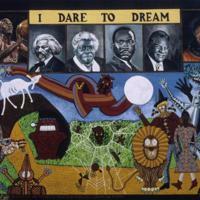 It depicts the faces of Thurgood Marshall, Mary McCleoud Bethune and the antislavery leader Frederick Douglass. 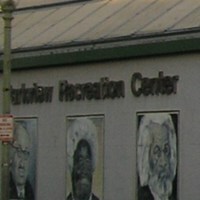 In 2010 the mural was repainted and includes the same faces. 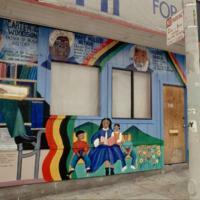 Painted in 1995 in San Francisco by artist Leboriae P. Smoore, this mural acts as a children’s textbook in the street, teaching about the antislavery leaders Harriet Tubman and Frederick Douglass, and other black figures: Carter G. Woodson, Mary McLeod Bethune, W.E.B. Du Bois, Ida B. Wells, and Jackie Robinson. In 1992, Selma Brown, Susan Cervantes and Ronnie Goodman painted images of the antislavery leaderes Sojourner Truth, Harriet Tubman and Frederick Douglass, as well as Mary McLeod Bethune, W.E.B. Du Bois, and Thurgood Marshall, at Ingleside Presbyterian Church and Community Center in San Francisco, California. The mural, titled The Great Cloud of Witnesses, was started by Revered G. when he pasted a single newspaper clipping of his hero, Muhammad Ali to the wall of the church gymnasium in 1980. Over the decades, the collage expanded to cover the entire gym, fellowship hall, stairways, hallways, bathrooms, basement and meeting rooms. The mural is multi-faceted and contains newspapers, magazine clippings, photographs, flyers, posters, prints, poetry and painted murals. 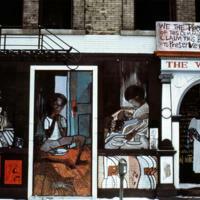 In 1970, a mural titled Racism appeared in the Cabrini-Green Housing Projects in Chicago’s southside. It celebrated black women who had been key participants in the struggle for black liberation. 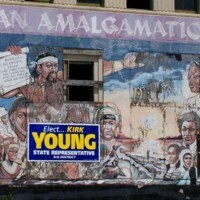 The mural depicted the faces of Nina Simone, Angela Davis and Kathleen Cleaver, along with the names of Aunt Jemima, Betty Shabazz, Cleopatra, Mary McLeod Bethune, Coretta Scott King and the abolitionist Sojourner Truth. 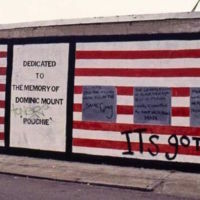 The mural was defaced with white paint shortly after its completion.